The District was formed in 1870 under the Reclamation District Law of 1868 for the purpose of forming a district to build levees and “reclaim” land subject to periodic overflow from neighboring rivers and water bodies. At this time the Government was promoting reclamation to develop swamp lands for the improvement and cultivation of the thousands of acres in California. On October 4, 1870 the Colusa and Yolo County Boards of Supervisors authorized the formation of a new Reclamation District and assigned it the number 108. 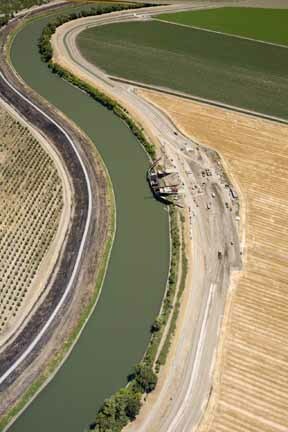 RD 108 is surrounded on three sides by levees, that include the west-side levees along the Sacramento River from Colusa to Knights Landing, a Back Levee along the District’s western boundary to prevent flooding from the Colusa Basin, and on the south along the slough that is also the northern levee for Reclamation District No. 787. The man y lands bordering the Sacramento River enjoy Riparian Water Rights from private ownership dating back to Spanish Land Grants. In 1917 the District filed a permit with the State to divert water from the Sacramento River for irrigation to the other lands within the District. The District’s first pumping plant was completed at Wilkins Slough in 1918 and is still the primary pumping plant for the District today. Of the nearly 100 reclamation districts in the state, RD 108 is one of four others that deliver irrigation water in addition to flood control. When Shasta Dam was built in the late 1940s, the newly constructed Central Valley Project created uncertainty for the historic water users on the Sacramento River. The issue was that the stored water from the reservoir was co-mingled with the rivers natural flows. The stored water was considered to be property of the Bureau of Reclamation and the natural flows included the water rights of historic water users. In 1964 USBR entered into a water right Settlement Contract with Sacramento River Water Users that preserved their prior and historic water rights and provided for some supplemental water during the summer months from the Central Valley Project. Because of the District’s established rights to surface water and its contract with Reclamation, surface water has supplied nearly all of the water needs of District lands. There is a limited development of groundwater supply for irrigation. Several irrigation districts in the Sacramento Valley came together to develop a Regional Basin Water Management Plan. Below is a link to the water resources plan. Identify cost-effective, feasible measurement methods appropriate for individual contractor service areas. Evaluate the benefits derived from measurement at turnout, lateral and district levels. Identify and evaluate potential water use issues and benefits of pricing water by volume measured at the turnout or customer level. Estimate potential costs associated with measurement programs at the district, lateral and turnout levels.